Received: From what can be made of the most recent notes received from MK today it states that his imminent release on the 13th / 14th December has been postponed as he is deemed “a risk”, and anyway, it is stated that he would be going straightaway to a hospital for treatment – the very treatment he has been denied for so long in the hole known as HMP Parc, with it’s “unique” G4S prison staff. Apparently, at the moment he is disallowed from living in England and will be forced to reside in a Cardiff bail hostel with strict and severe Probation Service overlooking when fit enough. 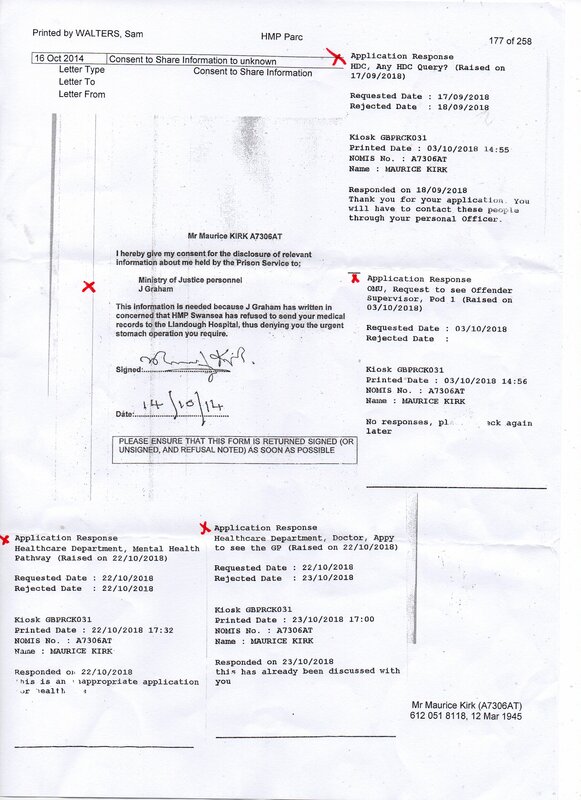 M states he is now denied writing paper and associated sundries – indeed, you name it, he’s denied it – EVEN BEING RELEASED now, along with which country he’s allowed to live in! As for him not being released when he is due to be soon, see “Man sentenced to months in jail is still behind bars 10 years later under sentence that no longer exists – D. Mirror 19 Sept. 2016” https://www.mirror.co.uk/news/uk-news/man-sentenced-17-months-jail-8867197 – and this guy is not the only one not being released after he’s done his time. Pic taken at the Cardiff Crown Court where Maurice Kirk was to be given 2 year sentence 18 weeks later [approx.] 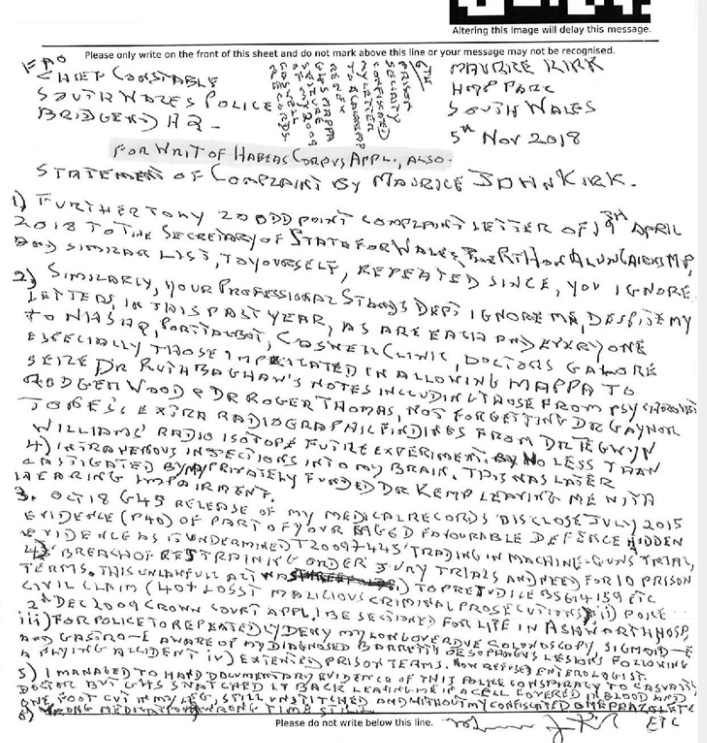 on the 14 Dec. 2017 – a complete miscarriage of justice connected to the “breaching of a restraining order” – an order that was never served properly and according to the law in the first place – therefore how could MK have breached any subsequent newer version of the order if the original order was never served upon him properly? that even a jury asked to see but which couldn’t be shown? It doesn’t make sense that newer versions of the order are in existence when the original cannot be produced, meaning this latest conviction is surely unsafe, and very illegal but, as they are too powerful, they get away with major indiscretions such as has happened now on a few occasions whereby Maurice Kirk has been imprisoned wrongly a number of times and, as a result has had to serve long custodial sentences – years in prison – for the “breaching of a restraining order” that there’s no definite proof of the original’s existence, let alone was served on him as it should have been. Yes, they tried to serve the original order on him by attempting to stuff it down his sock as he lay prone, on the floor outside a cell, surrounded by screws and/or police officers, but trying to stuff the said order in his pocket at the time proved unsuccessful too, so the order was never served according to the law, yet subsequent newer versions of the order have been manufactured as valid legal tools against MK. Sadly the law doesn’t work like that, and to suggest and act like it does is not only an “abuse of process”, and a complete “miscarriage of justice” BUT A CRIMINAL OFFENCE ALSO, as this, and other, sentence[s] have proven also to be! Received: A truly startling note from MK received today. 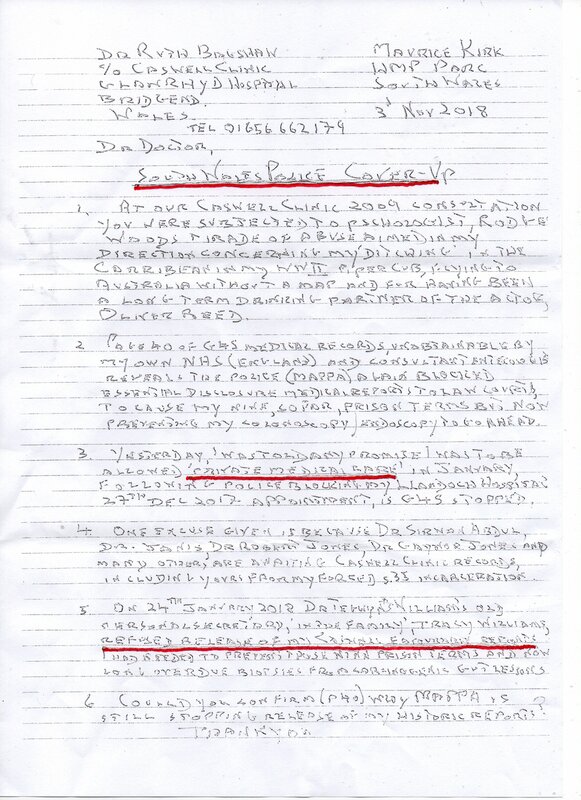 It starts off by stating that he is now barred from living in England, and when he is released, in the middle of next month, he is to go and reside in a particularly nasty place: a bail hostel in Cardiff, presumably until he can make further residential arrangements. WTF is going on with these characters in positions of so-called “authority” in Wales, and their cronies? 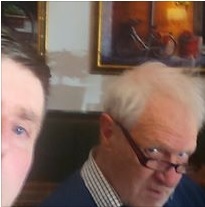 Whatever is going on with them – simply because Maurice has stood up against the [alleged] rancid corruption that is rife in the Welsh courts / judiciary / police forces and elsewhere for over 20+ years has now gone way too far, as if having to do over 7 years in prison since 2009 on highly questionable charges wasn’t enough. Maurice is deemed a MAPPA registered citizen – an allocation reserved for a particularly nasty number of anti-social citizens, such as rapists, child murderers and more recently terrorists – but Maurice is none of these! He is an ex-vetinerary surgeon before they took that career away from him – he cared for animals all his professional life – period! He would not hurt a fly has no charges of violence on any record or any other place that deems him a MAPPA subject! This is all lies and baloney making him a MAPPA subject so as neverending restrictions and prohibitions can be heaped upon him, whether he’s in prison or not, and half the time these false authorities [I call them false because they have shown themselves to be false and not genuine or of or for the people as Maurice’s experiences alone clearly show] can’t even agree on which level of MAPPA he is. If he’s in a prison, then he’s a Category One [at times] – if elsewhere the registration is changed to Cat 3 [at times] – sometimes they even say he’s not a MAPPA subject at all! It’s ludicrous when he doesn’t deserve a MAPPA registration at all! His MP who’s known him a long time – Mr. Alun Cairns – does little to help Maurice, it appears – who I’ve been told to contact re: a parliamentary contact, as Cairns is the Welsh Secretary. 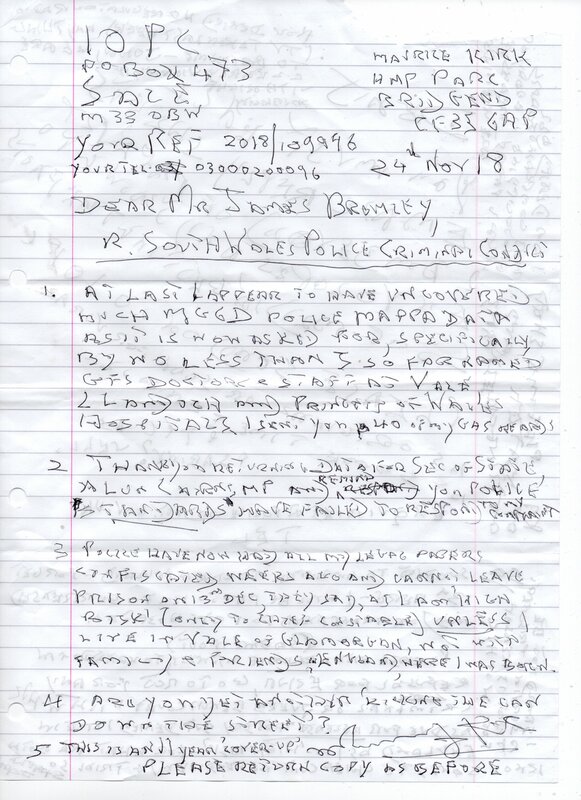 A few weeks ago, Cairns contacted me by email after I wrote to him complaining about the particularly savage lack of care M had been subjected to since December 2017 after entering HMP Parc. 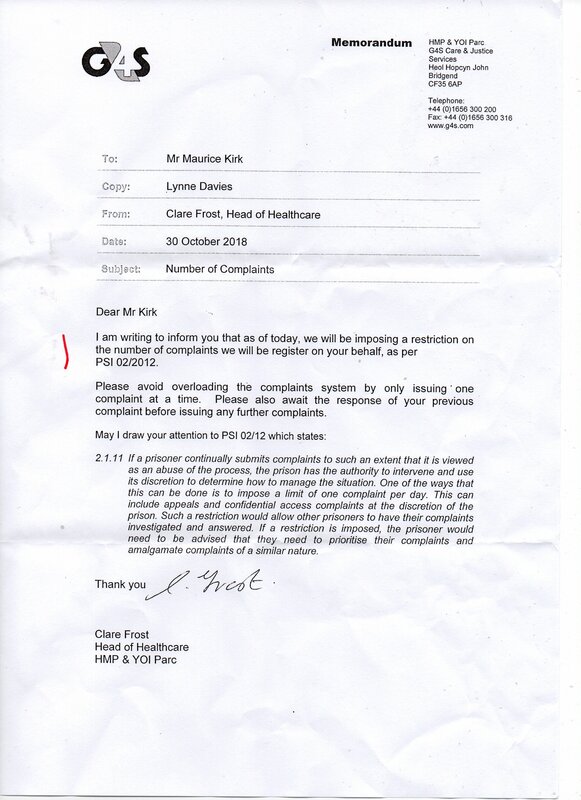 I received a reply stating the message was confidential, and that he would be visiting the HMP Parc bosses and would be discussing Maurice Kirk whilst there. Now, weeks later, it seems now that little good for Maurice came out of that stated contact by Mr. Cairns with the prison bosses, and perhaps this alleged meeting wasn’t to actually benefit or help Maurice regarding the irregularities he suffers in the first place, but rather the opposite was to be created. More fool me for thinking any outcome of Mr. Cairn’s visit might be in Maurice’s best interests! 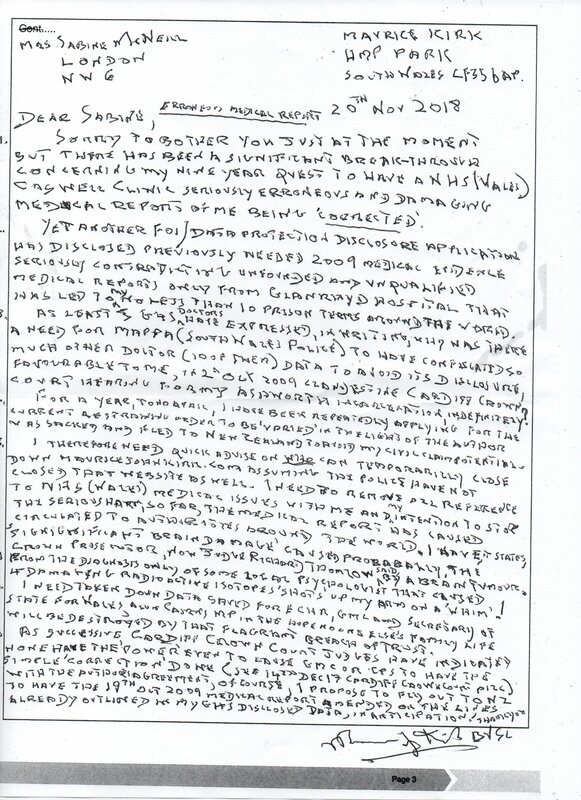 MK’s medication still ceases to be given to him, and M states also that his hospital appointments are still denied him, as well as private medical treatment, and so much more – contacts [phone calls] to his family are denied, as stated in this latest note, and now even postage stamps and other sundries from his weekly canteen that every prisoner is allowed are denied him, but, and much worse, he is to be barred from living in the UK!! What more can they do to affect this 73-year-old disabled O.A.P.? He will be on a probation watch list, and all the baloney that goes with being a marked man – and the reason for that is simply because he’s stood up to their malfeasance and treachery for 20+ years – and it seems they can’t handle it. 30 of what I would allege most citizens would consider to be perfectly reasonable cases of his against the Welsh authorities and others are denied him and are “in limbo” also now, connected in instances to at least 13 judges or the notorious South Wales police, or a particular doctors as M has stated previously [not only dr. TW who created the false “brain tumour” report that caused M to spend months in Caswell Clinic – the records of which are mostly completely unobtainable – another major irregularity]. 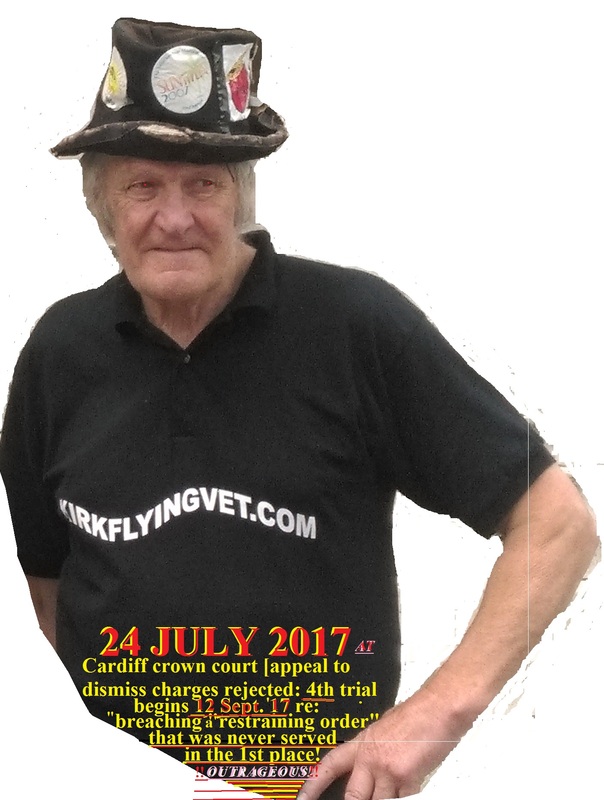 The fact that Maurice didn’t die in this recent custodial sentence, with it’s denial of medications and hospital medical treatment for serious stomach ailments that you or I would get immediate treatment for, and all the rest of the irregularities – is not Maurice’s fault!! And allowing Neanderthal-like thug heavies residing on the same wing as Maurice to threaten and intimidate him, with the full knowledge of the prison staff, I contend, is a particularly barbaric form of targeting. This is supposed to be a prison [which Maurice shouldn’t even be in again] not a replica World War 2 concentration camp where the effects of people such as MPs and the like could do exactly what they wanted and damn the consequences!! 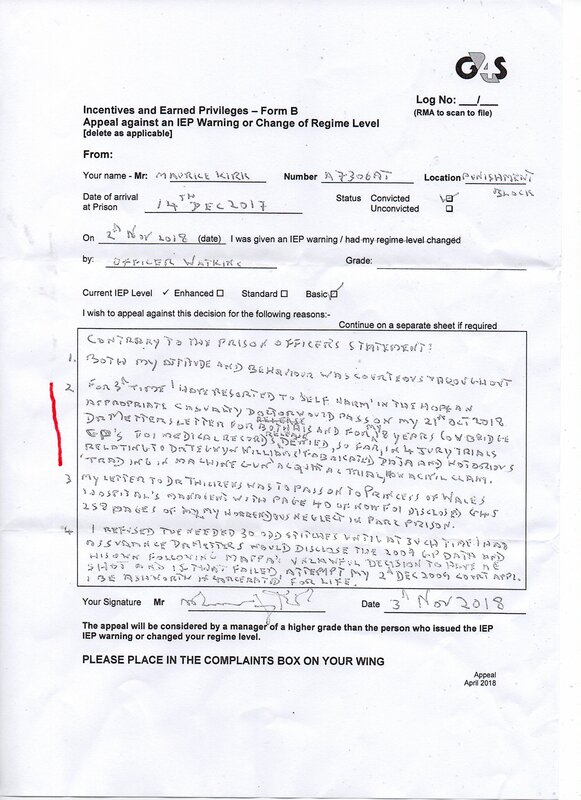 And thanks Mr. Cairns – your letter marked “confidential” was kept confidential, but now I know why, as MK’s situation has now gone now from very bad to even worse. Sleep well at night too – all of you responsible for this outrageous barbarism against a lone 73-year-old disabled man who wouldn’t hurt a fly – your salaries paid for by us – the people! The consequences of your abominable and wicked actions will not be felt in this place! If anything can’t be read in the above by anyone and they need a translation, pls get in touch and I will endeavour to try + tell you what is printed. I printed off and returned the entire note to MK with it marked with the sentences or whatever I couldn’t understand, and should have a reply soon. I know his mail is being messed with, especially as i’ve sent emails within the past fortnight with replies attached which haven’t been used which makes me thing he hasn’t received them, as are communications to his family denied now for him, as he states. But, we live in hope [what else is there?] and, until the bitter end, will oppose these examples of grotesque and inhuman targeting by those who should – and do – know better. It could have been any one of us who ended up in the position Maurice has found himself in 20+ years after it all began [unless you’re ok with characters such as these completely ruining your life] and Maurice has paid far too dearly by, eg. 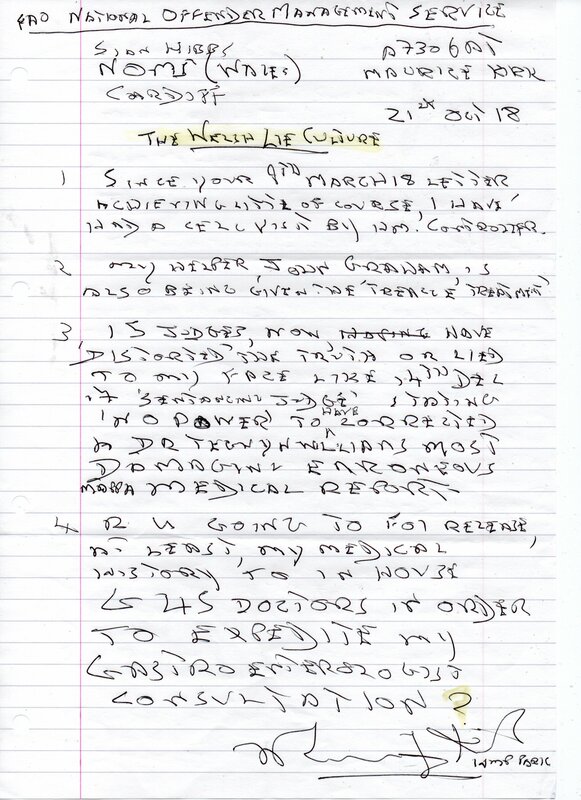 getting an acquittal in a [particularly rotten] case in 2009 where they tried to lock him away forever via and including a corrupt consultant doctor’s false “brain tumour” report, and all the rest of it, eg. painting a nonworking machine gun [which came with a vintage aeroplane purchased] a different colour to fool the jury, for starters] – that case known as the “machine gun case” – a case rife with malfeasance and other atrocities manufactured against MK so as to remove this thorn in their side forever, the end result of this unbelievable case intending to be that MK would be forced to be put in a closed mental unit for the rest of his days. This treachery didn’t work, they ballsed it up, the little dog had his day, and this hurts them. Too bad. My heart bleeds. NOT. 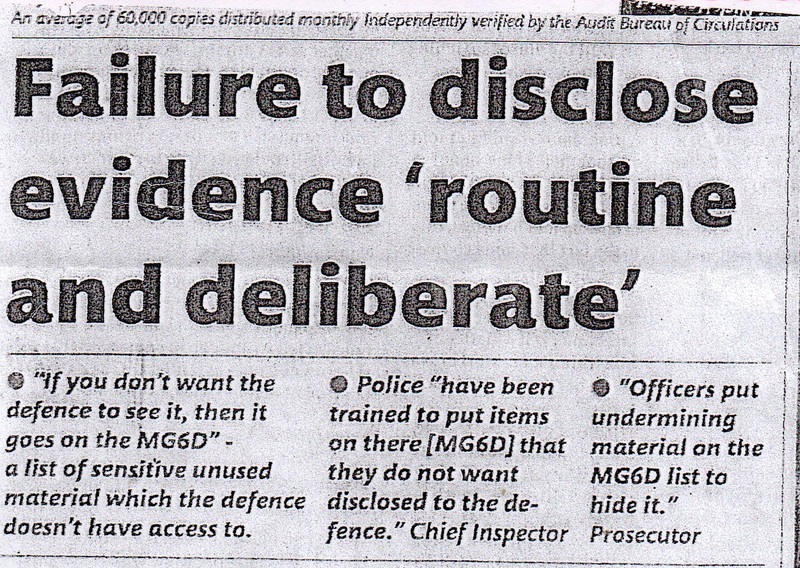 This, from the “Inside Times” prison newspaper shows how court cases can be manipulated away from true verdicts, by the denial of what could be vital evidence in cases using the “MG6D” rule – and IT’S TOTALLY LEGAL! Shockingly, an attempt by the authorities to section Maurice to a lunatic asylum failed miserably during the past few days, probably because he is quite sane and doesn’t need such convoluted attempts to make his persecution even more miserable than it already is. Maurice is in great pain constantly because this prison regime at HMP Parc refuse follow the laws of the land and let him have the hospital appointments in place, or private medical treatment, or give him the long-prescribed medication – Omerzaparole – that he is perfectly entitled to and was receiving before he entered this den of inequity. One might think the Welsh Secretary Mr. Alun Cairns MP, who has known Maurice a long time, as well as being his MP at times might actually do what he is paid to do and see to it that the laws of that land apply to Maurice and let him get the proper medical treatment he so badly needs and is perfectly entitled to which the authorities claim is there for clients that need it – and no one needs medical treatment more desperately then Maurice at the moment – but no, Mr. Cairns lets the debacle of Maurice’s medical situation fester and worsen despite being in a position of such high authority as the Welsh Secretary who should be able to get things done – if not Maurice’s dire medical situation then surely the totally fake medical report from the Welsh Caswell Clinic could be corrected, this totally false report originally manufactured by neer-do-wells such the a] former consultant doctor, head of Caswell Clinic [who left the NHS not long after Maurice’s acquittal at the trial which the report was concocted for way back in 2009 to section Maurice to a closed mental unit – Ashworth] and b] a certain police force – the South Wales police force – who are all involved in their respective lack of responsibilities by stopping Maurice’s parole this time round which should have begun on the 1st August, along with MAPPA. 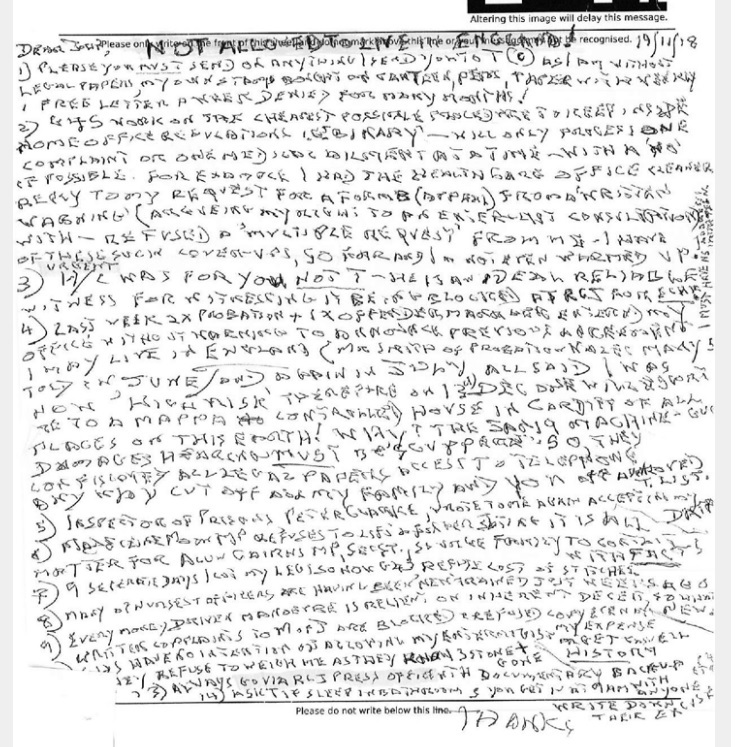 These, what can only be described as totally corrupt agencies are letting a confusing and totally false situation regarding Maurice’s MAPPA status run and run without the badly needed corrections happening that false reports would normally receive so more restrictions and persecutions can be heaped upon Maurice – the denial of Maurice’s parole, and the illegal denial of hospital treatment being 2 examples of serious malfeasance affecting Maurice’s life to a very large degree because these dubious agencies refuse to do their jobs properly and correct what needs correcting. And Mr. Cairns, the Welsh Secretary himself, doesn’t help either. Why is that? This insane situation has been ongoing since Maurice entered this hellhole in mid-December last year. Are they trying to kill Maurice by denying him the medical treatment he so badly needs yet is so illegally denied for 10 months? The answer can only be “yes” – by their own actions! This entry was posted in Uncategorized and tagged kirk, maurice. Bookmark the permalink.